Food and celebration are almost always tied together. As we head into autumn and the holiday season, food (and sweets!) seem to constantly dominate our minds. Similarly, it seems that many of Jesus’ most memorable interactions occur around food, from the libation-restoration at the Wedding of Cana, to the feeding of the five thousand, to the moment where he identifies his betrayer while dipping a piece of bread. Food infuses our relationships with beauty, and it often shows up in sacred moments. It’s no wonder, then, that two of our core business endeavors at FCS, as well as one of our major neighborhood engagement initiatives, revolve around food. We’ve shared about the fact that keeping bacon bits stocked serves not only as good business, but good community-building. Community Grounds draws neighbors in for a cup of coffee and a tasty breakfast sandwich, but also offers places to experience art and gather together. Indeed, gathering around food bonds people uniquely. This strange power of food for relationship building goes on full display bi-weekly through our partnership with Urban Recipe. Every other Wednesday, our building hosts Urban Recipe for a food co-op. Similar to food, shared work and purpose connects people. The food co-op manages to combine both food and work. The food co-op runs on neighborhood power. On co-op days, 35 predominantly senior women will be dragging out tables, picking up big old boxes. They sweat. They give it their all. “It’s a lot of work,” Pamela Stringfield, the Neighborhood Engagement Coordinator, remarked. The food truck backs up, and they unload.” At one recent co-op, Pamela marveled at a senior lady hauling bags of rice and throwing them over her shoulder. Once they lay out the food, co-op members pay close attention to distributing the food in a way that ensures all members get what they need. It takes hours, but when it’s all done, the gathering ends with a time of prayer, time of encouragement, and a song. Over the weeks and months of the gathering, a familiar, familial environment has emerged. As Bob Lupton once pointed out, “working for food is as fundamental as nature itself.” The Food Co-Op demonstrates that not only does everyone have something to bring to the table, they can swap at the table as well. On Co-Op days, members walk away healthier and nourished in a different way. 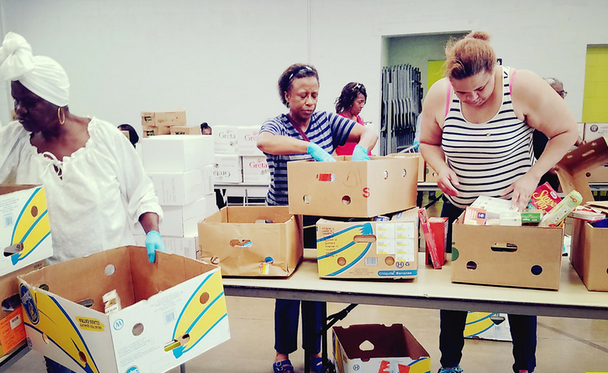 For $8 a month and a few hours of work, members of the South Atlanta Community unpack and share the mysterious power of food and community, walking away with a box of groceries and a box of stories. As we prepare for Thanksgiving, and the food-fellowship that will follow, let us all enjoy the warm power of food and the way it joins us with those close to us.